Cash flash reports show unpaid receivables and unpaid payables, as well as scheduled payments and deposits, for any time period. They are based on invoices from Accounts Payable and Accounts Receivable, as well as scheduled entries entered in the Cash Flash window. The Cash Flash report helps you plan your cash requirements by comparing expected client payments and deposits with planned vendor payments and other outlays. Cash flow reports can select unpaid invoices for any range of pay dates. An invoices pay date can be edited anytime, even if it is posted. Since cash flow reports only show unpaid client or vendor invoices, they dont include any payment not posted into A/P or A/R. Your rent check, for example, wont appear on the cash flow report unless the landlords invoice is added into Accounts Payable. 1 Choose Snapshots > Cash Flash. 2 Click the Update button. Clients & Profits X adds up the current bank balances from the G/L accounts marked with a cash flow category as Cash, the vendor balances from the A/P aging, and the client balances from the A/R aging. Todays payments and checks are calculating the days posted client payments and checked. 1 From the Cash Flash window, click the Email button. 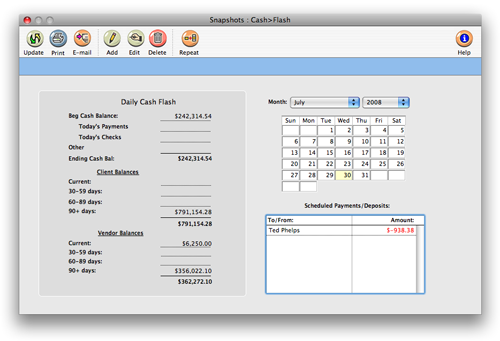 The Cash Flash can be sent to any active staff member. Youll be prompted to select a staff members name, then enter a note (which is added to the body of the e-mail message). The cash flash can also be ccd to two additional e-mail addresses. Since the shops account balances are highly confidential, be careful to only send the cash flash to an authorized staff member. 1 From the Cash Flash window, click the print button. 1 From the Cash Flash window, click the add button. 2 Enter the scheduled payment or deposits date and amount. If the entry is for a payment (cash out) the amount needs to be entered as a negative amount. 3 Enter who the money will be sent to or received from and a description. 4 Select to notify a staff member via e-mail of entry, then click OK.
Cash flash entries can be scheduled to repeat many times. To repeat an entry, select it in the Cash Flash window then click the Repeat button. The Repeat Entry dialog box opens, prompting you to enter the repeat interval (i.e., the number of days between entries), the number of times when the entry should be repeated, and when the scheduled entries should start. These entries only affect the Cash Flash window and report, and have no affect on A/P, A/R, or the General Ledger. Theyre simple reminders for better cash management.